Race 5 MRCZ - De website van onroad-electro! The fifth and final round of the Belgian Electric On-road Nationals was hosted by the MRCZ club in Zwevegem this past weekend. The race was held on a purpose built track laid out in a local parking lot. Two weeks before the Belgian nats, the club hosted a club race and an open practice during which it turned out that the grip levels were quite low, and this resulted in a lower turnout for this championship decider. In the three main classes of Touring Modified, Touring Stock and Formula the race for the overall title was still open. In Modified Olivier Bultynck (Awesomatix) could mathematically still be dethroned by Mitchell Van Es. Mitchell however had to use his 2014 Yokomo as his Awesomatix was written off before the event. The low grip however seemed to suit Mitchell’s car well. In Stock, the race would be even more important as Vincent Van Gansen (Xray) and Florian Joos (Tamiya) both had two wins and two second places. The driver who would reach a higher position than the other would be crowned champion. Finally in Formula, Steve Deblaere (Serpent) and Olivier Bultynck (Shepherd) were still in contention. Olivier had the best chances, but if Steve would take the win, they would both end as Belgian champion with tied points. The track was open on Saturday for free practice. The cars indeed didn’t had a lot of grip, so the drivers looked for different setups. Simultaneously with the washout during the Formula 1 qualifying in Monza, the heavens opened in Zwevegem and made the track soaking wet. After 3 hours, the track could be used again and the drivers found that the grip levels seemed to have improved. On Sunday morning however the track was still quite tricky, and the drivers struggled to find the pace from last year’s race. Most Modified drivers looked a bit grim at the start of Q1. Because of the higher power, the cars had almost no steering and no rear traction. Some drivers took the risk to register a set used and a set new tyres for the race. There were drivers who started on old tyres and never mounted the new ones, such was the tyre wear. Just like everyone expected, Olivier Bultynck (Awesomatix) set the fastest time in Q1. Local hero Thomas Stockman (Xray) finished only two seconds off of Ollie’s pace and set the second fastest lap time. 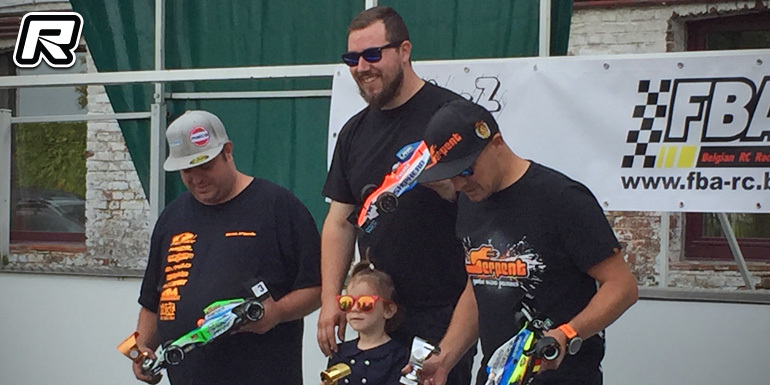 The biggest surprise came however from Mitchell Van Es, who put his 3-years old Yokomo BD7 on P2, merely one tenth behind Ollie. Nicolas Delisé (Awesomatix) took P4 in front of Rico Claeys (Xray). Q2 then again went to Ollie, this time he was three seconds faster than Thomas. Mitchell, Nicolas and Rico rounded off the top 5. In Q3 Olivier again went a bit faster then in Q2 and claimed the overall pole. Thomas finished in P2, followed by Rico, Mathieu Gesquire (Xray) and young Athan De Witte (VBC), giving the overall top 4 of Olivier Bultynck, Thomas Stockman, Rico Claeys and Nicolas Delisé. Highly motivated by his pole, Olivier took the lead and a convincing win in the opening A-main. He was followed by Mitchell Van Es, who was involved in a fierce battle with Thomas and Rico, while Nicolas claimed P5. For A2 and as the track was now at it’s prime, the power of the Modified cars could be truly unleashed. Olivier again took the victory and set a new lap record, proving that the grip was at its best. Mitchell was again involved in a close battle, but this time with Nicolas Delisé. Mitchell kept his cool to claim P2 while Thomas and Rico finished in P4 and P5. Having just claimed his ninth consecutive Belgian title in Modified, Olivier elected not to run in A3. What followed was a fine 4-horse battle between Mitchell, Thomas, Nicolas and Rico. Somehow Mitchell found his way past Thomas and kept his lead. In the meantime, Thomas was under attack from Nicolas. When Thomas ran wide, Nicolas passed Thomas and looked set for a solid P2 finish. In the last lap however, Thomas saw an opportunity to pass Nicolas when his Awesomatix understeered and he took P2. Rico and Athan rounded off the top 5. Behind Olivier Bultyinck (Awesomatix), Mitchell Van Es (Yokomo), Thomas Stockman (Xray), Nicolas Delisé (Awesomatix) and Rico Claeys (Xray) would make up the top 5 at the final round of the championship. In Touring Stock qualifying Stefan Rommens (Team Magic) was on form for this final race of the season. He pipped championship leader Vincent Van Gansen (Xray) for P1. 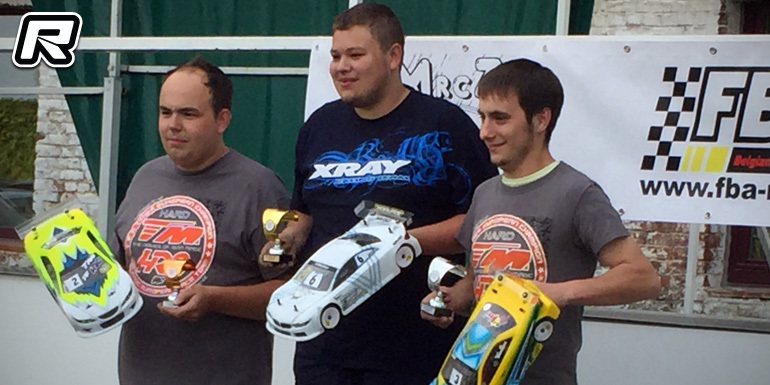 In the meantime Pasquinel Neys (Team Magic) pipped the other championship contender Florian Joos (Tamiya) for 3rd. They were followed by the Xray of Giovanni Moguez. In Q2, Stefan again had a very fast pace, but two errors in laps three and four ended his TQ run. Vincent took the provisional pole, in front of Florian and Pasquinel. Florian’s car was still on the low-grip setup and he recorded the slowest single lap time of the top 6 leading drivers. Q3 again seemed to see Stefan in front, but an error in the penultimate lap ended his scorching pace. Vincent took the overall pole by setting some fast and steady lap times in Q3. Pasquinel Neys also did a stellar job by taking P2 in front of teammate Stefan Rommens. They were followed by the Awesomatix of Xavier Debroye and the Team Associated of Christophe Charlier. The other championship contender, Florian Joos was relegated to a low 6th position. It was later found that his pace was compromised by a faulty rear drive shaft which robbed the transmission of some power. In the opening A-main Vincent could already smell his title and he made the hole shot at the start of A1. He took a convincing lead, never set a foot wrong and claimed A1. Florian showed his race strength by claiming P2 with the slowest car of the top 6. P3 went to Giovanni Moguez (Xray), Stevan Rommens and Xavier Debroye (Awesomatix). In A2 Vincent again took a great start, but he made an error on lap two. This relegated Pasquinel Neys (Team Magic) to first place, but he was chased by teammate Stefan Rommens. They battled wheel to wheel to the end, but it was Pasquinel who claimed the victory. Christophe Charlier (Team Associated) finished in P3 with Vincent and Florian in his slipstream. The latter got collected by a lower placed car at the start and lost nine seconds lying on his roof. Despite this awful setback, he was still optimistic for A3. In the final main Vincent had a great start, just like in A1 and took the win. By doing so, he deservedly crowned himself for the first time as Belgian champion. He was followed by the battling Team Magic duo of Stefan Rommens and Pasquinel Neys. Christophe Charlier finished in P4 with Xavier Debroye in his wheel marks. Poor Florian was again collected, but this time on lap two. He regained his P6 when the other car received a stop and go penalty. He tried his best to regain the lost seven seconds, but couldn’t defend his chances with a tweaked car. 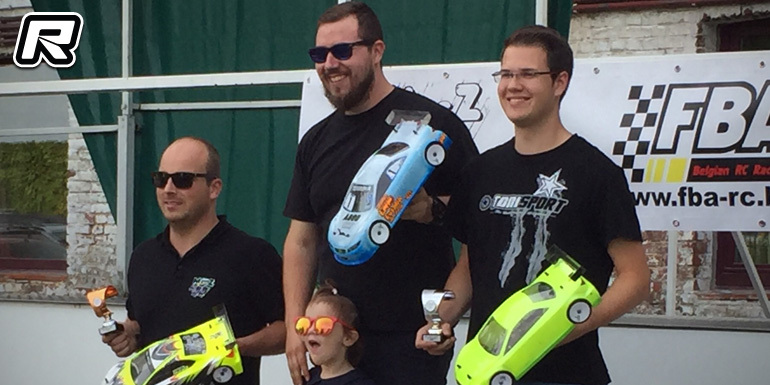 The day’s top five was Vincent Van Gansen (Xray), Stefan Rommens (Team Magic), Pasquinel Neys, who took his first podium with his Team Magic, Florian Joos (Tamiya) and Christophe Charlier (Associated). In Formula Olivier Bultynck (Shepherd) set the early pace with a 17-lapper. Steve Deblaere (Serpent) took the runner up spot and set the single fastest lap time. In Q2 Ollie substantially improved his lap time and recorded an 18-lapper, again followed by Steve. Olivier repeated this performance in Q3 and took the pole in front of Steve, Patrick Jongenelis (Serpent), Kris Vanbleu (Xray) and Orfeo Tremour (Serpent). Between the first and last qualifying, the lap times improved by 1.1 second and by the end of Q3 the track had near perfect grip levels. During the first few laps of the first final, Ollie set some blistering laps and pulled a gap on Steve. Near the end of this stint Steve recorded similar lap times, but it was too late to catch Ollie, who took a deserved win. Patrick took P3, in front of Kris and Lorenzo Vandepoele (Xray). In A2 Ollie again took the hole shot and never looked back. After four laps, Steve went almost as fast, but the gap was too big. At the end of the race, a backmarker took Steve out, so he had to settle for P3 behind Patrick Jongenelis who took a fine P2. Kris and Orfeo rounded of the top 5. As Ollie choose not to race in A3, Steve took a convincing win which handed him the P2 spot for the race and in the championship. The overall top 5 result for the race was Olivier Bultynck (Shepherd), Steve Deblaere (Serpent), Patrick Jongenelis (Serpent), Kris Vanbleu (Xray) and Orfeo Tremour (Serpent).